Curry leaf plays an important role as a condiment in the culinary preparation of South Indian dishes. It is cultivated in field scale in Coimbatore, Periyar, Madurai, Salem and Trichy districts of Tamil Nadu and in Dharward, Belgaum and Uttara Kannada of Karnataka State. 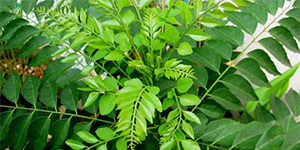 The botanical name of the curry leaf is Murrya koenigii Spreng. It belongs to the family Rutaceae. It does not require a specific climate and can come up in dry climate too. In places where minimum temperature goes below 130C, the growth of shoot will be slightly affected. Though it can be cultivated in most of the soil types, it comes up well in light textured red soils. Farmer prefers local varieties, which have pink midrib. University of Agricultural Science, Dharwad has recently released two cultivars viz DWD  1 and DWD 2 which have an oil content of 5.22 and 4.09% respectively. Both the varieties are having strong aroma. Mainfield should be ploughed repeatedly. Normally, a spacing of 90 to 120cm is followed on either side. One month before planting, pits of 30 x 30 x 30cm dimensions are dug out and are filled with top soil mixed with well decomposed farm yard manure at the time of planting. Healthy seedlings are planted in the centre of the pits. Then long furrows are formed connecting all the pits to facilitate easy irrigation. The seedlings are irrigated once in five to seven days upto three years and once in 15 days afterwards. The field should be kept free of weeds. Normally curry leaf plants are not fertilized with inorganic source by the farmers. However, for a better growth and yield, each plant may be fertilized with 20kg of Farmyard manure besides 150g nitrogen, 25g phosphorus, and 50g of potash per year. The plantation can be kept for 20 to 25 years depending upon the management practices followed. Aphids attack the plant when the plants are in vegetative stage and spraying of dimethoate at the rate of 2ml/litre of water is recommended. Leaves from such sprayed plants should not be harvested for 10 days lest residual toxicity of the pesticide. Leaf spots sometimes occur and spraying carbendazim at the rate of one gram per litre is recommended.